Gary Shanahan, Galway United, in action against Dave Mulcahy, Bohemians. SSE Airtricity League Premier Division, Galway United v Bohemians. Eamonn Deacy Park, . 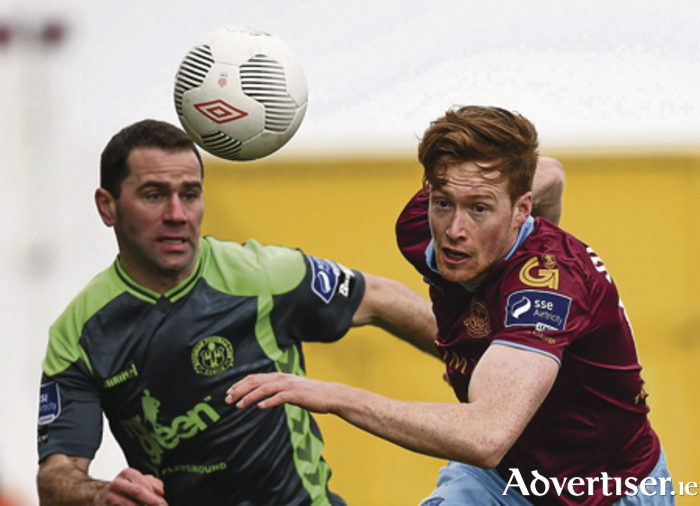 ncouraged by a "reasonably good start" to the SSE Airtricity League premier division, Tommy Dunne's improving Galway United outfit face a demanding assignment away to Shamrock Rovers at Tallaght Stadium tomorrow (8pm ). On Saturday Vinny Faherty's opportunistic late goal against Bohemians ensured United claimed a third league win in five matches, but manager Dunne is not getting carried away. “We have to look at it as a reasonably good start,” Dunne admits. “We have to just keep going, keep working hard to see where that takes us. We aren’t silly in our thoughts to think that we are good enough to be dismissing other teams. We cannot afford to do that. In the 2015 campaign Bohemians earned points and plaudits as the surprise packets, but Dunne insists United cannot be classed in a similar category just yet. The spirited manner in which United eked out a 1-0 victory over the Gypsies delighted Dunne, who is enthused by the resilience his squad demonstrated. “We feel that last year we probably made a mistake. We want to play in the right way, the guys want to play, I want them to play, but conditions sometimes dictate. “We felt at the start of the season this year that we would be a bit more dogged and a bit more of a difficult team to beat. In fairness to the guys, probably the main reason why we’ve not conceded a huge amount of goals is they’ve worked extremely hard. They are fit, once you’re really fit you give yourself a chance. Plus they are concentrated, we’ve probably settled down a little bit quicker than other teams. We have a decent enough balance within the team. The balance we have has allowed us to get a reasonably good start. Next on the agenda for United is a clash with Pat Fenlon's Hoops, and Dunne is expecting a "tough test" in the capital. “Rovers have played only four games, they’ve three wins and one defeat,” Dunne says. “They will look to turn us over at Tallaght, but we are hungry to try to get something. If we do, it is a bonus. Galway United Supporters Trust are running a bus to Fridays match at Tallaght Stadium, leaving from The Dail Bar at 4.00pm. Seats can be bookedby contacting Ronan Coleman at (087 ) 6972823.